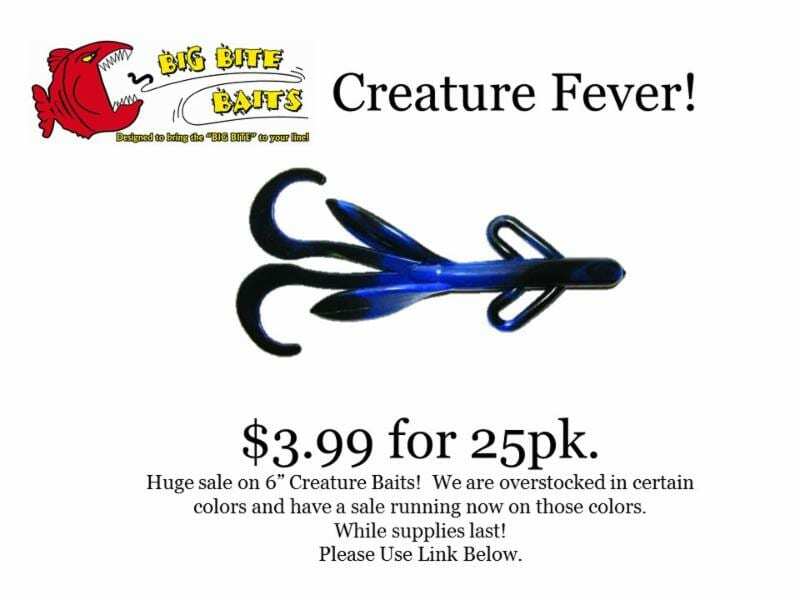 BIG BITE MAY NEWS LETTER - Big Bite Baits, Inc.
Just like the tradition of bass hitting the shallows every year in the spring to hunt for food and spawn we are bringing you the next Big Bite News Letter that talks about Trick Sticks. There is something about spring, shallow bass, and Trick Sticks they just seem to go together. We have included some new rigs and tactics for this edition of the News Letter so sit back and take in this month’s Tips For Tricks. Here is how it all started, Trick Sticks rigged with no weight. There is something about a slow falling Trick Stick that no bass can seem to resist, rigged weightless the Trick Stick has a slow shimmy action to its fall. Match your hook size to the Trick Stick you are using and you will be all set. 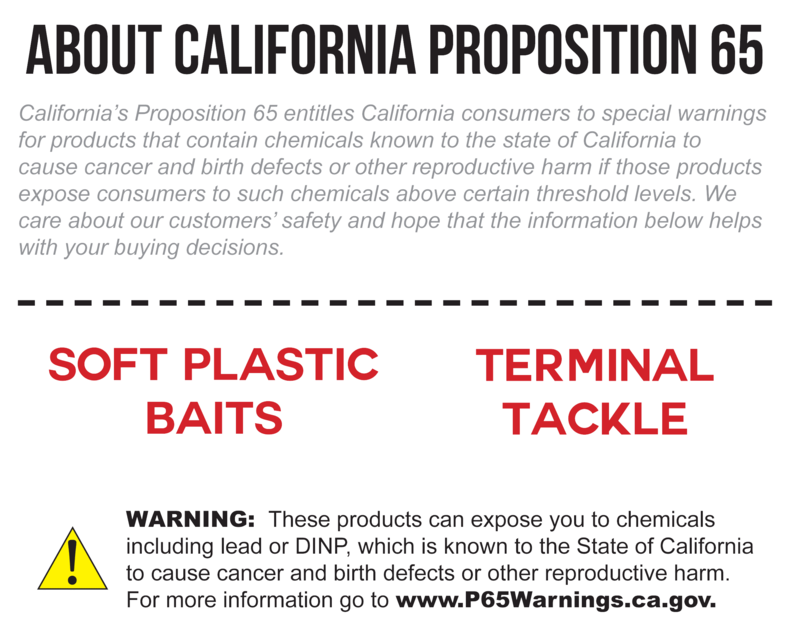 I generally match up a 5″ Trick Stick with a 4/0 EWG Gamakatsu worm hook, and if I go to a 4″ Trick I downsize to a 3/0 EWG Gamakatsu hook, if I up size to a 6″ Trick I upsize my hook as well to a 5/0 EWG Gamakatsu. I generally let the conditions help me choose my equipment for fishing an un-weighted Trick. If I am fishing the 4″ and 5″ Tricks I many times will opt for a spinning setup, 7′ medium action rod with a matching spinning reel, spooled with either 8lb to 10lb Sunline Sniper line. If I am fishing in cover I will opt to go to Sunline SX1 20lb braided line as my line choice. When fishing around heavy cover that the bass can get me down into and break me off I will opt to change to a baitcaster setup and beef up my line size. I will use a 7ft medium action rod that is teamed with a baitcaster reel that is spooled with either 12lb to 16lb Sunline Sniper or 30lb SX1 braided line depending on conditions that I am fishing this is also the setup that I fish my 6″ Trick Sticks on. Weighting the Trick Stick will make it do different things as it falls, a lot of this action will depends where you place the weight. If you use a bullet worm weight in the front of the Trick Stick the Trick Stick will fall nose first into the cover you are fishing. You could say it has a nose down fall/swimming action. I use this rigging if the bass are active. If you use a weighted hook with the weight in the middle when the Trick Stick falls, it falls more in a horizontal straight position. I have found that this is one of the best ways to rig the Trick Stick if the bass are shut off or in a neutral mood. This bait coming down towards the bottom in a hover mode is sometimes more than they can resist. One of the newest ways to fish a Trick Stick has come forward in the last few years is to tail weight the Trick Stick. This will make the Trick Stick fall backwards on a slack line. This rigging and tactic excels when fishing around docks and laydowns. When you pull the bait forward then give the bait slack by lowering the rod tip the Trick Stick will fall backwards. This tactic works great when working around cover or docks where you can lead the bait to an opening then drop it back into an area that may be holding bass. When it comes to rigging the tail weighted Trick Stick you can do this in a few different ways, one of the easiest ways is to use either sheet metal or wood screws. This rigging will allow you to adjust the weight by changing the screw size. Another way is to use a screw lock weight. Take a weight that has a screw lock and screw it into the tail of the Trick Stick. The last way is to use lead nails. You can get these and cut them to the weight that is needed or you can use copper wire as a backup plan if needed. When it comes to equipment I pretty much follow what was said above. When faced with bass in an inactive mood one of the baits that I always turn towards is a Trick Stick that is rigged on a weedless jig head. When the bass are active they will sit on the tops of the weeds chasing food, but when they get inactive they will have a tendency to sit at the bottom of the weedline many times facing out looking for something easy to eat coming by, a Trick Stick on a weedless jig head fills this bill perfect. I have rigged the Trick Stick on, both weedless and exposed hook jig heads; I let the conditions dictate this choice. When it comes to equipment for me it is a spinning setup all the way. I use a 7ft medium action spinning setup teamed with a matching spinning reel that is spooled with 8lb to 10lb Sunline Sniper line, or I will go up to 20lb Sunline SX1 braid if conditions call for it. Over the years there have been a few different ways of how to rig and fish the Trick Stick that came from fishermen that had an idea; this is an example of one of these ideas. Looking at this rigging you will say to yourself “why didn’t I come up with this idea myself”. To make this rigging you will need a few different parts. To start take a 5″or 6″ Trick Stick and Texas rig it onto your hook. Next you will need Hitchhicker and a swivel with either a snap or a split ring and your choice of spinner blade. Thread your Hitchhiker into the tail of your Trick Stick with the swivel rigged onto the Hitchhicker. Next you need to put some thought into the blade you choose. If you are just looking at add some flash to your offering you will want to pick a willow leaf blade. If you are looking to slow the fall down and add a little sound attraction you will want a Colorado blade option. If you are looking to fall in between then choose an Indiana blade option. 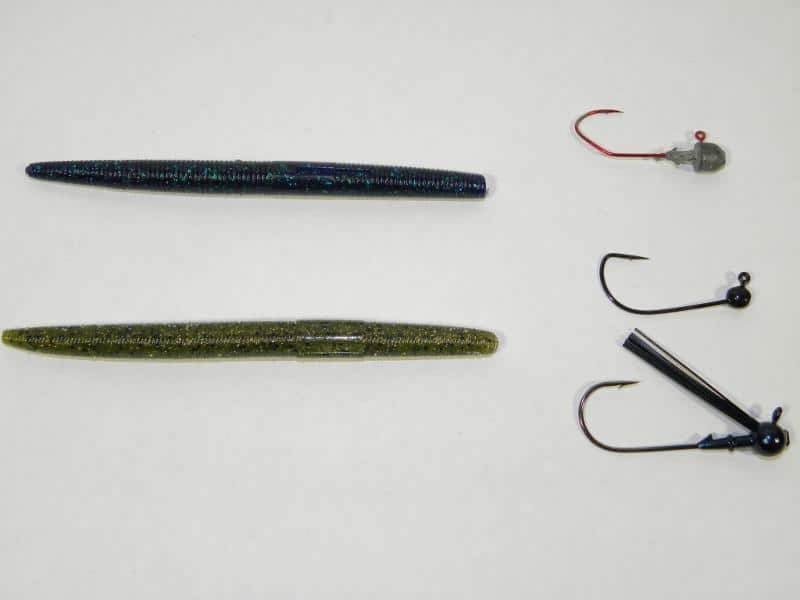 Fishing options, you can fish your Trick in a slow swimming action where you slowly reel your Trick Stick back in, or use a tradition lift and drop like you were fishing a Texas rigged Trick. Equipment wise I fish this offering more on a 7ft medium action baitcaster, teamed with a baitcasting reel spooled with 12lb to 16lb Sunline Sniper line. 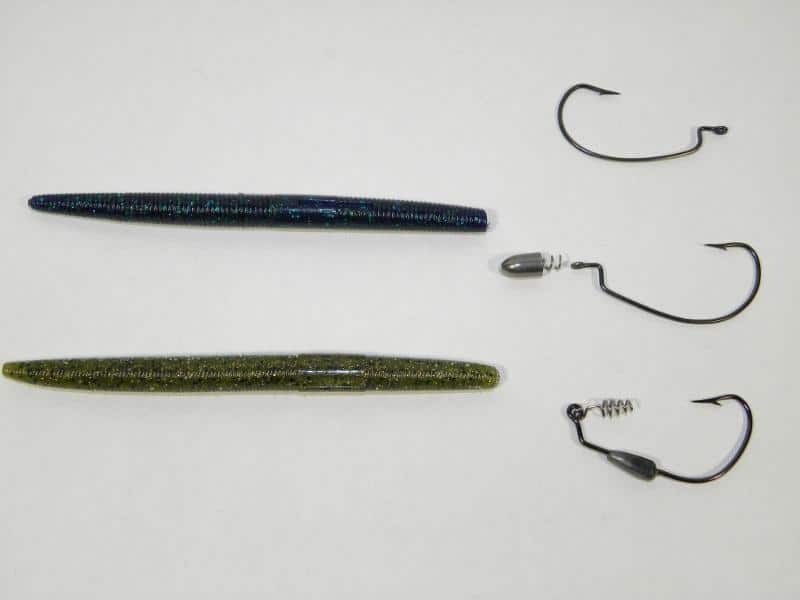 One of the most popular ways to fish the Trick Stick the last few years has been to rig it wacky style in fact to help you with this rigging Big Bite has made a Wacky Rig Trick Stick that has an o-ring molded right into the Trick Stick for you to run your hook through. However you rig it fishing a Trick Stick wacky style should be in your arsenal of plans when you hit the water anytime. One of the biggest changes in this category has been the different jig heads that have hit the market now. Please take a closer look at what’s available to enhance your wacky rigging. I fish my Wacky Rigs on a spinning setup 7′ medium, teamed with a matching spinning reel that is spooled with 8lb to 10lb Sunline Sniper line. If fishing in and around cover I opt to use a 7ft medium action baitcaster setup teamed with a baitcaster reel that is spooled with 12lb Sunline Sniper line. 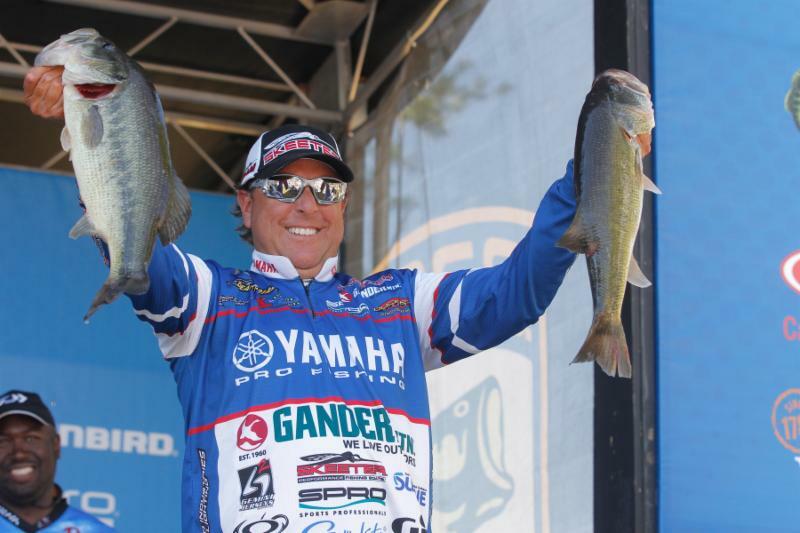 Big Bite Pro Dean Rojas leads the Elite tour Angler Of The Year points race heading into the second half of the season. Dean has had 3 Top 12 finishes and has finished no lower than 19th this season so far. 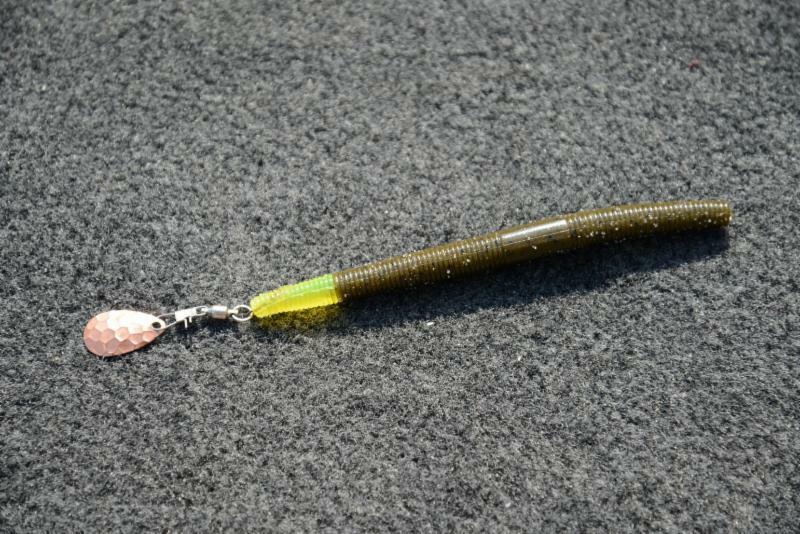 Much of Deans success has come on 2 of his Big Bite Signature Baits the Warmouth in Shall Cracker and War Party colors and the Rojas Fighting Frog in Tilapia, Vegas Flash and Can’t Resist It colors. Dean has a 10 point lead heading into BASSfest on Kentucky Lake over Justin Lucas.